The pitiful plight of Nigerian pensioners cannot be overemphasized as it is very evident that the government whose responsibility is to cater for their wellbeing does not care about them especially when they handover the affairs of the retirees to corrupt and unscrupulous officials. I recall reading a newspaper report sometime during the Yar’adua era, about how a young man who wanted to collect his father’s gratuity was asked to cough out 40 percent by the officers-in-charge at the ‘pension house of horror’, before he could get his father’s gratuity. The ‘pension house of horror’ became a goldmine for pension officers. Albeit Yar’adua as a listening President, acted swiftly and cancelled the dangerous programme and corrupt system of pensioners’ verification in Abuja, the mind boggling report of 40 percent deduction from retirees’ gratuities opened the can of worms of corruption in the pension house of horror. Nigeria is a big fraud and this explains why politicians, political office holders, technocrats and their cronies see the country as a big cow available for milking by those who have its custody, while a majority of their citizens watch helplessly from a distance. Those who arrogate to themselves the virtue of patriotism while they practice the opposite, are Nigeria’s biggest problem. It is from their population we have cheats, corrupt leaders, bribe takers and givers; and a large crowd of Yes-men including sycophants whose only objective is to feather their nests; or in the present political lingo, service their stomach infrastructure. Perhaps, it is only in Nigeria that virtues such as integrity, honesty, dedication to duty, tolerance and humility are not encouraged by the leadership, both political and religious. That justice is purchasable here is a fact a former President of Court of Appeal, Justice Ayo Salami, highlighted in 2014, during his address at the Nigerian Bar Association, NBA, Ilorin branch. He had lamented that some senior retired jurists were “bribing and intimidating judges” under the guise of practising legal consultancy. Nothing could be more despicable than this. When corruption, nepotism and tribalism characterise leadership, then hope is lost. The 2015 Corruption Perception Index by Transparency International ranked Nigeria as the 26th most corrupt nation in the world. In Nigeria, corruption is one behavioural trait that defines our big men and women; and it is quite unfortunate that these corrupt cabals are so celebrated. The fight against corruption by the Muhammadu Buhari-led administration, though not really genuine but vindictive, appears to scratch the surface of the problem. The nation’s structure is fraudulently designed; and this is why cynics are not tired of reminding us of “the mistake of 1914,” a charge first made by the late Premier of Northern Nigeria, Sir Ahmadu Bello. There is nothing for the poor in Nigeria. Where are the good roads and railway transport, which the poor would have benefited from? Many years ago, travelling by air was by choice but not anymore; air travel is now for the rich. There are no more, good public primary and secondary schools with well-motivated teachers. Expensive private, primary, secondary and tertiary institutions have taken over. Children of the poor attend public schools, while the rich send their children to expensive private schools within and outside the country. Public health facilities like maternities, dispensaries, community hospitals are poorly funded and staffed. No public or community-built health facilities are functioning properly in most states. Therefore, the poor and the retirees who are owed arrears of pensions of up to 30 months in most states of the defunct Eastern region and have not received gratuities in the last 15 years die daily for the mere fact that they could no more take care of themselves. Worse still, these senior citizens are even picking the bills of their children who are graduates, some of whom have remained without jobs in the past 10 years. Serving one’s country with integrity and commitment is no more appreciated by the government as kleptomania, nepotism, sycophancy have taken the centre stage in governance. The last time we had a government that cared for the poor to some extent was during the Second Republic. Most of the governors during this period did their best for their people. In Imo State for instance, Dr. Sam Mbakwe was a father to all; and was nicknamed “a weeping governor” because of his deep concern for the challenges his people faced, especially the Ndiegoro erosion disaster, which was beyond the capacity of the state to handle. Indeed, he dedicated his life to public service; and there are still landmarks to exemplify this. We were given the impression that if the Power Holding Company of Nigeria was privatised, electricity would be everywhere. But privatisation has come and gone, where then is the electrcity? Those who privatised this national infrastructural behemoth were also the same people who bought them. If you must have some electricity in your home, then you have to own a generator. The compound where I reside in Enugu, which housed six families, each had its own generator. It was bedlam every night, with its many health consequences for the citizens, especially the young and the elderly. Of recent, many families have been wiped out because of carbon monoxide inhaled from generators while asleep. There is no way anyone will enjoy sleep when the tranquility of the night is disturbed from the din generators make. 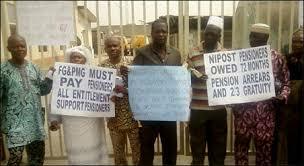 Pensioners are dying in their hundreds every day in Nigeria, as federal and state governments fail to pay retirees their gratuities and pensions as at when due. It is painful that the Federal Government through PenCOM, has not settled the gratuities and pensions of all retired federal staff since January 2016, and this is in spite of the fact that they are contributors to the pension scheme introduced by the government in 2004. If you retire without owning a house, business, or a fat bank account, then, life assumes a Hobbesian turn– brutish, nasty and short. You lose respect. People of integrity are mocked even in the churches. Everything is wrong with Nigeria. Recall the exchanges between former President Olusegun Obasanjo and members of the National Assembly and you will come to the realisation that Nigeria is indeed, a big fraud. It has no place for the poor. If a teenager was lynched allegedly for stealing garri recently, which meant that he was hungry, then we have all lost our humanity. I must drop my pen here.